Home / Service & Repairs / Equipment Care and Maintenance / How Often Should I Get My Dive Gear Serviced? 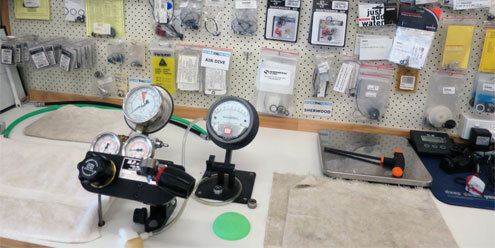 If we'd ask you the question, "How often should you service your regulator? ", the most likely response we'd get would be "once a year". And most would say you'd be correct, but is it really that simple? According to Peter Fear, our very own Scuba Doctor, "When regulators came out in the 1950s, diaphragms, valve seals, and O-rings were made from rubber, which were prone to developing memory after repeated use, keeping them from sealing properly. So, the dive industry adopted the practice of annual maintenance." The basic single hose, separate first and second stage regulator design invented right here in Melbourne by Ted Eldred in the early 1950s, almost 10 years before the rest of the world was introduced to the system, still works extremely well to this day. Yes, even though we now have balanced pistons, downstream valves, and extra low pressure ports to make the units more complicated. However, today's dive gear manufacturers also use much better materials for moving parts and casings than regulators of the past, making the topic of how often scuba gear should be serviced a grey area. Of course, modern equipment materials generally last much longer than a year. Still, you will be hard-pressed to find a dive industry voice that doesn't recommend annual maintenance. So does your gear still need servicing as often? Well maybe, and maybe not! A XXXXXXXXXX authorized technician must verify the correct operation of the regulator every year or every 100 dives, whichever comes first. Conducting an annual service is also mandatory in order to maintain the limited lifetime warranty. In order to maintain the product warranty and optimum performance your regulator must receive service from an authorized XXXXXXXXXX dealer every 24 months or 300 hours of use, whichever comes first. You must obtain factory prescribed service for your regulator at least once a year from an authorized XXXXXXXXXX dealer, regardless of the amount of use it has received. Your regulator may require this service more frequently, depending on the amount of use it receives and the environmental conditions in which it is used. If the regulator is used for rental or training purposes, it will require complete overhaul and factory prescribed service every three to six months. The correct functioning of the regulator is dependent upon proper maintenance. Therefore, your regulator should be submitted to a XXXXXXXXXX authorized service centre for inspection at least once a year. It is also recommended that the first stage valve be replaced every two years or every 200 diving hours. So, in many cases, how often you service your dive gear comes down to the equipment's warranties and a matter of precaution. To keep your dive gear under warranty, equipment manufacturers typically require that the equipment is inspected and serviced annually. However, some manufacturers, such as Atomic Aquatics, only require servicing after two years or 300 dive hours. Of course, some manufactures will stipulate a shorter service interval. Generally, you need to do what the manufacturer stipulates to keep your warranty. The Scuba Doctor, like most dive shops and repair facilities, still recommends that your dive gear should be serviced yearly, or after every 80 to 100 dives. However, there are some places that recommend that scuba equipment be inspected and serviced after only 20 dives per year! We suspect their customers must be resort divers who only use their gear infrequently, plus don't know how to look after it and store it properly. There are divers who openly question the need for annual servicing. They say that manufacturers will recommend annual servicing because they are prone to lawsuits, and there is some truth in that. Of course, in Australia the standards stipulate, and Worksafe / OHS requirements mandate, that dive shops must not fill scuba cylinders/tanks/bottles that haven't been tested within twelve months. So on some of your dive equipment you don't really have any choice as to how often it's serviced. We believe every diver wants their equipment to perform flawlessly. However, since divers treat and handle their gear differently, no one approach to servicing fits everyone. Plus some divers are in fresh water, chlorinated pool water or salt water and each water type can have different impacts on your dive gear. For new equipment, the warranty of the manufacturer should be considered when making a servicing decision. Ultimately, how often you use your equipment, your comfort level between service intervals, and your ability to recognise the performance level of your equipment, should also be considered when choosing when to get your dive equipment serviced. We suggest you consider the following rule of thumb: Never dive your regulator and other dive kit if you don’t trust it to perform flawlessly, even in an unanticipated out-of-air emergency where a much greater demand is placed on it. If you don’t believe it is in this condition, have it serviced.